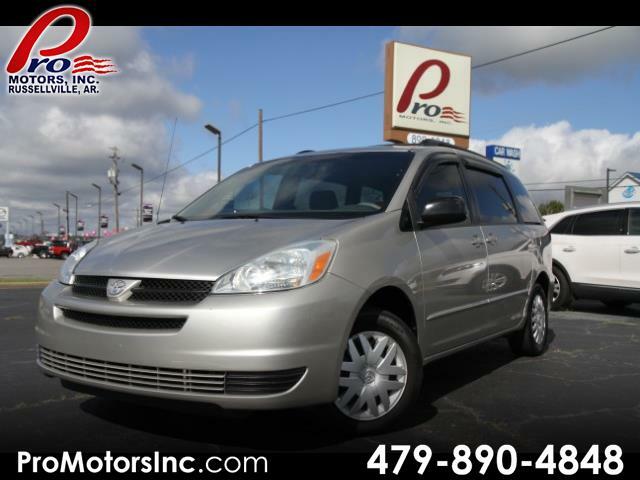 Used 2005 Toyota Sienna LE - 7 Passenger Seating for Sale in Russellville AR 72802 Pro Motors Inc. $3,998.00! !....LAST CHANCE FOR AN AFFORDABLE DEPENDABLE VEHICLE! !.......HURRY AND DON'T MISS OUT!!....REDUCED!! Locally owned...GREAT 2ND or 3RD VEHICLE! Affordable and "Lot's of Room" for half the soccer team...lol...This is one of the most dependable vehicles on the road today!! Automatic Transmission, V-6 Fuel Injected Engine, Air Conditioning (ICE COLD), Right-Side Power Sliding Door, Power Windows, Power Door Locks, Power Mirrors, Tilt Steering Wheel, Electronic Cruise Control, AM/FM/CD Stereo System and much, much more! HURRY!! This will go fast! Dependable, reliable and warranties available! ON THE SPOT FINANCING UP TO 84 MONTHS AND INTEREST RATES AS LOW AS 2.9% W.A.C.! SERVING THE 'RIVER VALLEY' FOR OVER 24 YEARS!!! A DEALER YOU CAN TRUST! !